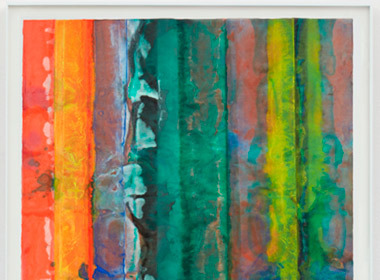 Sam Gilliam (b. Tupelo, Mississippi, 1933) is one of America’s most prominent abstract painters. Works by the artist, who has lived and worked in Washington, D.C., since 1962, are held by numerous museums including the Art Institute of Chicago, the MoMA (New York), the National Gallery of Art, and the Whitney Museum of Art. The Music of Color is his first solo exhibition in Europe. The show puts the focus on the years between 1967 and 1973, the period of the greatest radicalism in Gilliam’s oeuvre. His Yves Klein Blue, which harks back to his experimental early work, was presented at the 57th Venice Biennale in 2017. In 1967, Gilliam began work on a series of what came to be known as beveled-edge paintings: he poured acrylic paint directly onto the unprimed canvas, which he folded and crumpled while the paint was still wet. He then stretched the canvas over a chamfered frame, lending the painting a spatial and object-like quality. Gilliam’s signature creative achievement is the drape paintings series, begun in 1968, for which he applied the same procedure as in the beveled-edge paintings but then released the canvas from the stretcher frame. Unlike easel paintings, which usually function independently of their context, the drape paintings evince a performative aspect and interact with their respective settings; they can be installed in a variety of ways depending on the spatial context. Gilliam strove to blur the widely accepted boundary between painting and sculpture even as prominent contemporaries such as Donald Judd sought to reaffirm it. The paintings he created between 1967 and 1973 stand out for their monumentality and forceful use of color. The canvas becomes a medium that records traces of the production process and exhibits its own physicality. At a time when painting seemed to be in decline, Gilliam breathed new life into it; jazz was an important source of inspiration for his expressive and energetic style.